This is was the only sunflower I brought into the studio to paint during the summer of 2018. The summer flew by, and flowers can be so fleeting. This painting is available at the Principle Gallery, Alexandria. “David Harum” Peony was completed last year by commission, it was a surprise birthday gift. 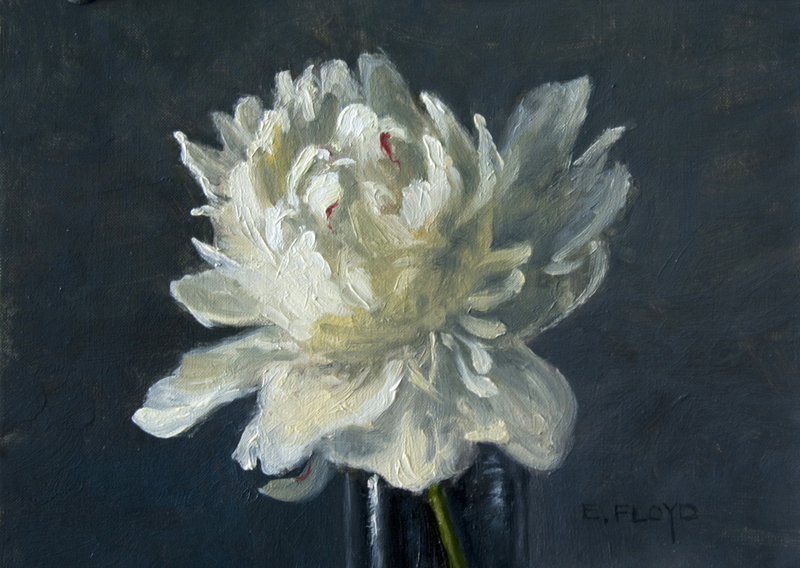 I take a few paintings commissions of specific flowers I grow each year, and these paintings make fantastic gifts. My floral still-life paintings are only completed from life when my garden flowers are in season. Peonies start opening the first week in May and continue blooming through early June. 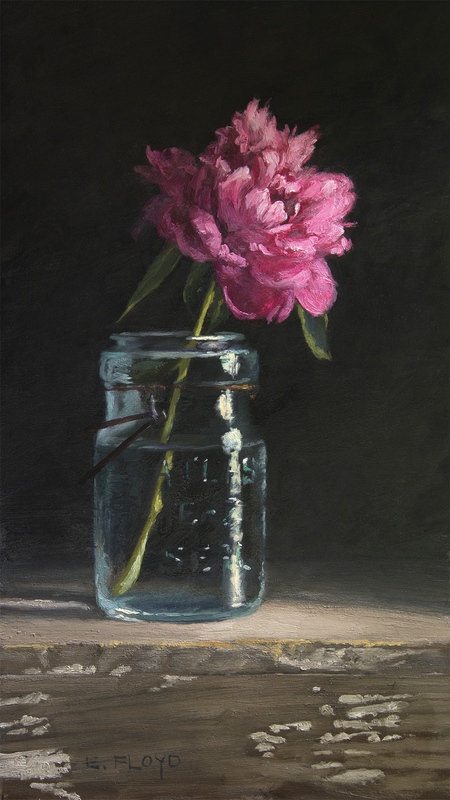 Reserve your commission now and secure my studio time during peony season. In my quest to always paint the flowers that I grow in my garden, about three years ago, I began reading more about gardening. The magazine that has had the most influence on me in the last few years is the British periodical, "Gardens Illustrated" and as a result of religiously reading this magazine from cover to cover, I have begun to realize how helpful it is to use the correct names for the different plants and flowers I grow. This is a painting I began on my own in the studio, and then demonstrated to my Saturday morning students how I finish a piece. Sometimes this final phase where I am tying up loose ends and trying to unify a piece can take extra time to resolve. So after the 3-hour class was over, I continued on a bit more adding the finishing touches. For the past two summers I have had Queen Anne’s Lace growing in my garden and have always wanted to paint it. This year I finally came up with the idea of how I wanted to highlight and accent all of the characteristics that so mesmerize and captivate me with regard to this flower. Queen Anne’s lace is a delicate white flower with carrot-top like leaves, everything about this flower, the stems, the flower heads and the leaves are all lace like and I wanted to make this aspect of the flower read even more so in my painting. This painting is composed of a vintage sunburst quilt with beautiful golds and blues and reds on a creamy feedsack background. 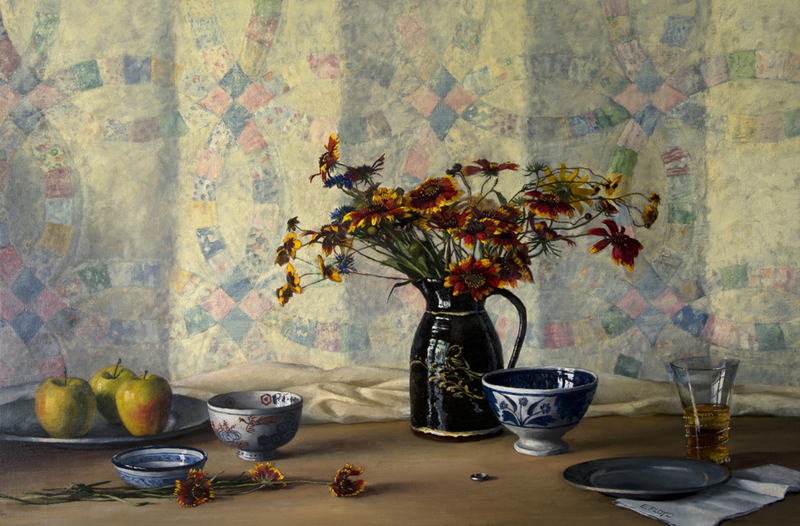 The sun patterns of the quilt repeat the flat dense umbel shape of the flower heads, while the large Provence comfit jars offset the delicate and spindly nature of the flowers. 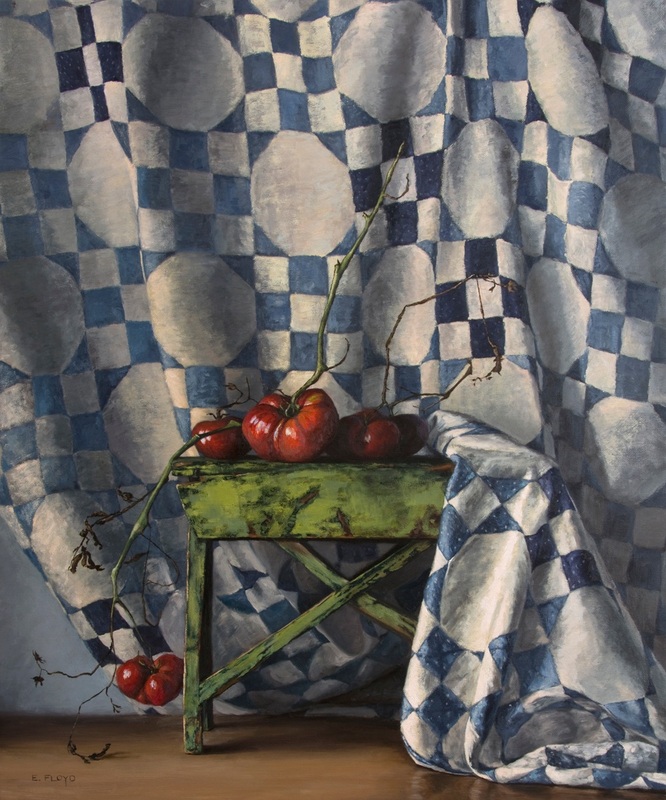 Overall the painting composition is about similarities and opposites with my love of fabric and pattern included into the mix. The tulip season nearly passed me by, I feel fortunate that I was able to paint this painting in the spring. I have found that I am unwilling to cut my tulips in the garden sometimes, they just look so lovely. Every time I am at my kitchen window, I look out at three new camellia bushes, they bring me so much joy. For several years the view out of my kitchen was plain, then early this spring I realized that I wanted to add some evergreen hedging against the fence opposite my kitchen window, I only wish I had planted them sooner. To me, my expanding garden is one of the deepest felt and enjoyed pleasures in my life. Yes, each time I expand a part of my garden I wonder, why am I giving myself more to do outside when I barely keep up with what I have, but when a new area gets planted, all those reservations go away. This painting is the first of many camellia paintings to come. Bittersweet is a vine I have come to associate with cool autumn rambles on nature trails in and around the area I live (Alexandria, VA). It was on one of my solitary walks many years ago that I first encountered the exuberant color and form of the bittersweet vine. This painting is an ode to marriage. Celebrating the fidelity of love, the industriousness required to make a marriage good and the chance for renewal and growth when part of something bigger than oneself. In the exuberance of the growing season, late summer tomatoes harvested and still warm from the sun are one of my favorite reasons to garden.